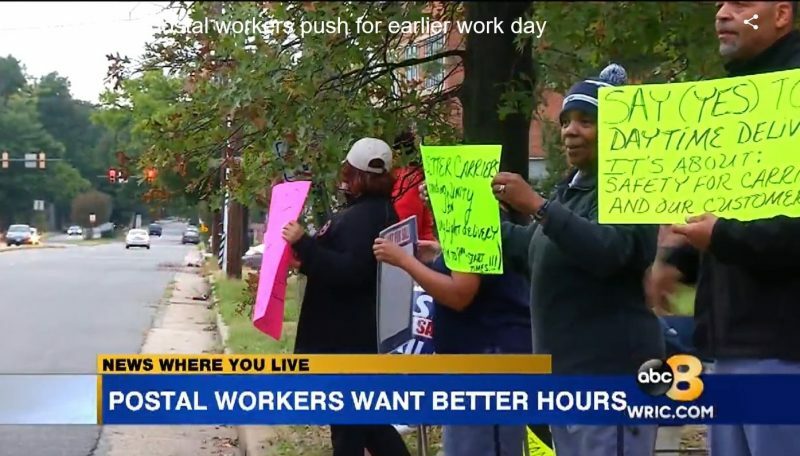 RICHMOND, Va. (WRIC) – Saturday morning United States Postal Workers were protesting along Brook Road, demanding an early start to their workday. With signs in hand, employees were speaking out about their safety and the safety of their customers. Employees tell 8News, right now they begin their day at 9 a.m., forcing them to deliver mail after the sun sets. This entry was posted in City Carrier Business, General Union Business, On the Job Injuries and tagged daytime delivery, delivery in the dark, demonstrating, letter carrier safety, protests, rallies, Richmond. Bookmark the permalink.